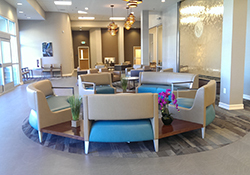 Oroville Hospital’s newly renovated medical complex, Dove’s Landing, is now open. The complex features an upscale atmosphere, state-of-the-art equipment and a private setting. Services include a new multi-specialty medical practice, outpatient rehabilitation, aesthetic medicine, urgent care clinic and pharmacy. The 68,000-square-foot medical complex was previously occupied by retailer Montgomery Wards and has been vacant since the late ‘90s. With building renovation complete, Oroville Hospital is now able to provide more private pay medical options for members of the community. Multi-Specialty Practice: The new medical practice features health providers from a variety of specialties who can meet the overall health needs of each individual. Our experienced providers specializing in cardiology, internal medicine, nephrology and urology work with each patient to determine individualized treatment plans that promote health and quality of life. The internal medicine practice accepts Medicare and most private insurance plans. Outpatient Rehabilitation Center: The outpatient rehabilitation facility offers spacioustherapy rooms, an expanded gym area and new equipment to meet the rehabilitation needs of each patient. Our board certified therapists offer several types of rehabilitation therapies to improve patient health and overall function including occupational, physical and speech therapy and ergonomic services. The rehabilitation center accepts all insurance plans. Aesthetic Medicine(Opening Soon): Led by Dr. Anjali Kohli, the Aesthetic Medicine practice provides a spa-like feel and a private environment. Based on the belief that a youthful appearance is a sign of good health, Dr. Kohli provides skin-enhancing, non-surgical beauty treatments. Services include botox, laser hair removal, fillers, micro laser peel, skin firming, and vascular and redness reduction. Cosmetic procedures offered by Aesthetic Medicine are not covered by insurance and require payment upfront for services rendered. Urgent Care (Opening Soon): The new clinic is staffed by experienced and knowledgeable mid-level providers whose familiarity with urgent care mean patients will receive quality care in an efficient and private setting. The urgent care clinic offers short wait times in addition to being a great alternative to expensive emergency room visits. Services include general illness treatment such as cold or flu, X-rays, immunizations, health physicals and more. The clinic accepts Medicare and most private insurance plans. Dove’s Landing Pharmacy: The pharmacy offers ease of access, ample parking and staff to ensure each individual is helped quickly. Dove’s Landing Pharmacy has access to both brand name and generic medications and works closely with physicians to prevent adverse reactions and ensure access to medications. The pharmacy accepts all insurance plans. Dove’s Landing is located at 2450 Oro Dam Blvd. For more information about health services offered, please visit www.OrovilleHospital.com/DovesLanding.